The 23rd Post of this Blog Page will cover our Light Projects which kick off with the DRC (Democratic Republic of Congo) Appeal, the return of our All-Year Round Projects (i.e. Play, Run and Vote) and our last reminder about the Gifts of Peace. BEFORE THE GIFTS OF PEACE CAMPAIGN ENDS! We are again appealing to you/potential donors to donate or support our Gifts of Peace. Sometimes, we take peace as granted but for those living in poverty it isn’t! You can donate to make peace become a reality in their life this January 2018. 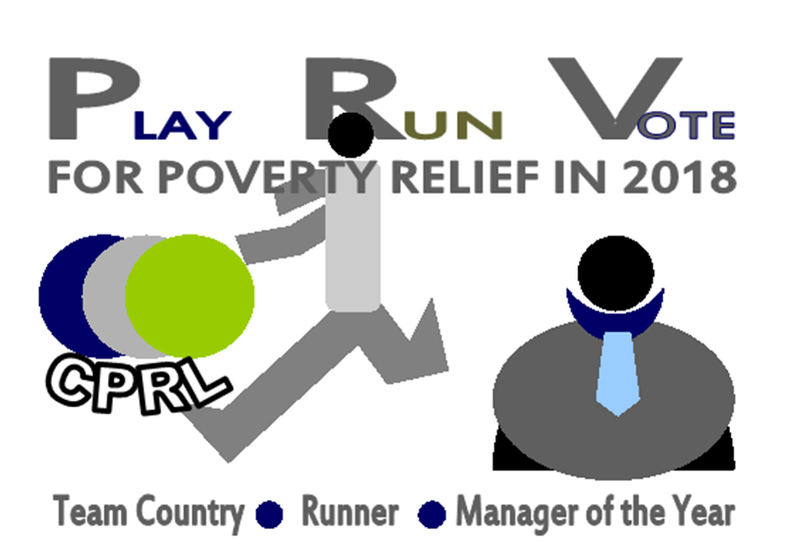 Play the CPRL for the Passion of the Poverty Relief Game! CENFACS’ first tier poverty relief competition is still on. You can join the game at any time this Winter 2018. Which of your team country will reach the Finals Last Four Next Autumn? To know that you need Playing or Gaming for Poverty Relief and Development. Please don’t forget to tell your game story including fixtures, scores and results. As said above, our Light Projects 2018 are kicking off this week by Lighting a Blaze of Hope for Conflict and Flood Victims in the Central Africa, particularly in the Democratic Republic of Congo (DRC). 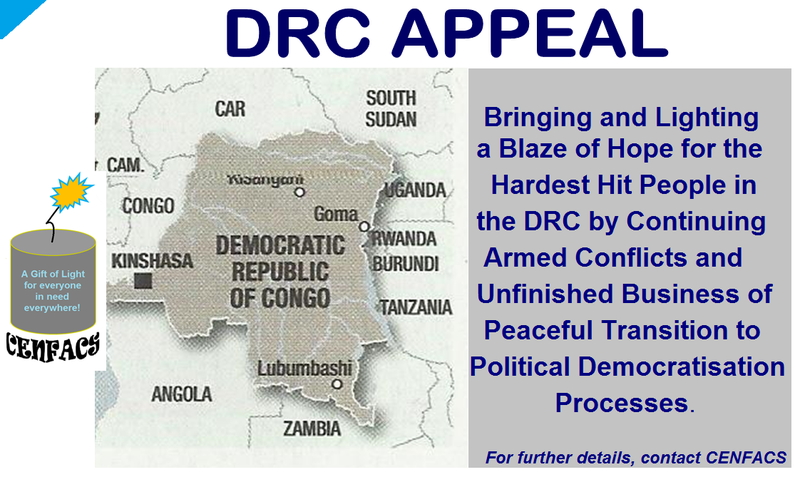 This is a continuation of last year appeal on the same DRC. Last year, we appealed to you and to the international development community to light a blaze of hope for the local people of DRC for their unfinished democratic transition to be resolved in peace. Many of you responded to our appeal and we thank you for your response. This year, since there is a repeat of potential fights between the conflicting sides together with the flooding situation which occurred recently, we would like to appeal to you again to do something new to the complex humanitarian and democratically disputed circumstances of the DRC. Because of the nature of CENFACS ‘Light Project (addressing the two problems faced by the victims of armed conflicts and destructive natural disasters), we will conduct two appeals for DRC this year. We are first re-launching our appeal to support Conflict Victims this week, and then the following week we will focus on Flood Victims. To support DRC Appeal, contact CENFACS. To get a better understanding of the contents/summaries presented above, please continue to read below. This first wave of Winter 2018 Light Appeal projects is about Bringing and Lighting a Blaze of Hope for the Hardest Hit People in the DRC by Continuing Armed Conflicts and Unfinished Business of Peaceful Transition to Political Democratisation Processes. Since the DRC embarked in the mid-1990s on the process of political democratisation, their new experience has never ended. Instead, it resulted in continuing armed conflicts and political instability, particularly in the eastern side of the country without excluding the Capital Kinshasa. As a charitable organisation, we understand the level of complexity of the issues there and the arguments/reasons from different conflicting sides. What we are interested in are the innocent local people of the DRC who have been hardest hit for almost two decades and half of neglect and suffering from this controversial process. Our appeal is apolitical and impartial. It is about supporting the ordinary local poor Congolese people who have been caught in a political process they do not control and that made their lives miserable since it began. We are Lighting a Blaze of Hope for Poverty Relief and Development so that the local Congolese people in DRC could turn their two decades and half of suffering into a future of hope, peaceful and sustainable development. We are advocating and hoping that the wisdom will prevail from the mindsets of all involved parties so that the lives of vulnerable and poor DRC local people are protected while this process is still going through until it finishes peacefully. WHO ARE THOSE LOCAL PEOPLE WHO NEED A BLAZE OF HOPE? These are: the victims of sporadic or organised violence, the dissatisfied with blocked election process, the discontented of two decades and half of unsuccessful transition to political democratization, the continuously poor unpaid workers and civil servants, poor farmers victims of weak international commodity prices and declining terms of trade, internally displaced persons especially in the Kasai and Kivu, innocent victims of local rebel factions and armed ethnic militias that control some parts of the Congolese territory and destabilized the territory, the poor local people paying the price of high levels of corruption at the high-level of the country’s governance, those who have been denied of free expression and voice, in brief the angry for the lack of freedom from the Unfinished Business of Transition Process to Political Democratisation. These are the poor local sufferers from civil unrest, economic insecurity and armed conflicts. HOW TO SUPPORT THEM AND COMMUNICATE WITH CENFACS? ALL-YEAR ROUND PROJECTS ARE BACK! Our three All-year Round Projects – which are Play, Run and Vote – are back this January 2018 for another year running. There are many ways you can support CENFACS’ 2018 RUN TO REDUCE POVERTY IN AFRICA (2018 RRPA). For more details about CENFACS’ 2018 Run To Reduce Poverty in Africa, please contact CENFACS. The World’s Development League without Relegation! Those who make progress on poverty reduction get rewarded by moving up on top their economic grouping/band. Those who fall behind poverty reduction get the support they need, not a punishment. RALLY BEHIND YOUR TEAM-COUNTRY AND SUPPORT THEM TO WIN OVER POVERTY AND HARDSHIPS AS WELL ESCAPE FROM POVERTY FOR EVER! The 2018 championship of CENFACS Poverty Relief League (CPRL) started since the beginning of the year. You can play or support projects for poverty relief in Africa. If you have not yet registered and or started to play for poverty relief and development, you can still register to play and or support. Relieving poverty is not an exclusive business or a matter of specific organisations or individuals who have that task, skills, capacity, mission or vision. Poverty can be relieved by everybody as long as they have the willingness, ability and wisdom to do so. However, to continue to relieve it requires more than the above qualities; perhaps it could demand passion, hard-working enterprise and above all tireless work. Having considered a number of experiences, works and evidence-based stories about people’s contribution to poverty relief, CENFACS set up in 2014 an all-year round scheme aiming at finding the Poverty Relief Manager (PRM) of the year. This is a Vote project – a yearly project of selecting, voting and rewarding in CENFACS’ way and terms people’s contribution to poverty relief in Africa. This project is run together with the projects RUN TO REDUCE POVERTY IN AFRICA and CENFACS POVERTY RELIEF LEAGUE, which are also all-year round ones. For basic details for those who want to vote this year’s PRM, please contact CENFACS. Whether you are Gaming or Running or even Voting for Poverty Relief and Development, please keep a track record (including the facts, data, videos, reviews and images) of your all-year round activities to make and share your story with us and others. To do that, you do not need sophisticated technologies or a third party. With your mobile phone only – if you have one – you can text, record voices, make a video, take pictures, phone etc to capture and communicate the impacts of any event or activity you are doing or taking part in this year. As we are in CENFACS’ Year of Local People or the Locals’ Year, don’t forget to involve Local People in your event/project. ANNOUCEMENT OF 2017 RUN, PLAY AND VOTE ACTION-RESULTS: Still Pending! The Action-Results of 2017 are still pending for many of our players, runners and voters of poverty relief. We would like to hear from you about the Best African Countries of 2017 which best reduced poverty, the Best African Global Games Runners of 2017, and the Best African Development Managers of 2017. If you have not yet told us, have your say now!